Last month, my family and I spent three busy days exploring New York City. We covered a lot of ground on foot, on subways, and in taxis, but never so much (and in as enjoyable a manner) than when we spent a full morning biking the Hudson River Greenway and Brooklyn Bridge with a fleet of bikes rented from New York City’s Bike and Roll. Bike and Roll (which has eleven NYC locations) offers guided tours along the Greenway and Brooklyn Bridge daily, but families can also opt to pedal off on their own at any time, which works great with packed travel schedules. We choose to partner our self-guided rentals withNew York Water Taxi, experiencing their ‘Bike the Brooklyn Bridge, Water Taxi Back’ package, which includes rentals from Bike and Roll and vouchers for a water taxi ride from Brooklyn back to our point of origin (Pier 84). A fabulous way to see a large amount of the city without worrying about navigation (and not getting tired feet! ), we found this route to be much more relaxing than we’d thought it would be. 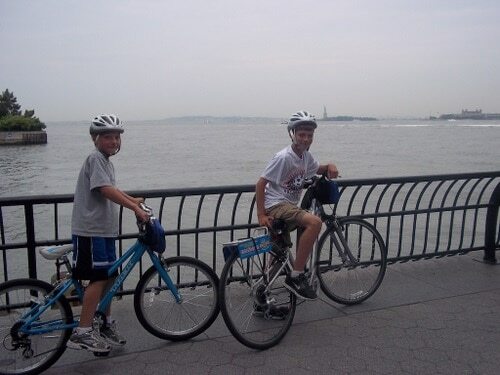 The kids loved the bike riding, and three-fourths of the time, we were on bike and pedestrian-only paths paralleling the street and the Hudson River. During the stretches we did have to join traffic (in bike lanes), the route was well marked with green bike symbols and arrows. The route took us south from Pier 84 (next to the Air and Space Museum) to Battery Park, at which point we retraced our last mile to Warren St, where we cut through the Financial District (just a few blocks in a bike lane) to the Brooklyn Bridge. (We could have shortened our route by not continuing to Battery Park, but the views of the Statue of Liberty and Ellis Island are well-worth the detour.) Once we’d crossed the Brooklyn Bridge (which was very cool, and again, easier to navigate than we’d thought), we followed signage to Fulton Ferry Park where we caught a water taxi back to Pier 84. The water taxi included a friendly guide pointing out the sights along the way, was not at all crowded, and afforded yet another great view of the Statue of Liberty, Ellis Island, and downtown Manhattan. Water Taxi Tip: In addition to being a fun way to return your bikes at the end of your greenway and Brooklyn Bridge tour, water taxis are a great way to see the harbor. Their hop-on, hop-off passes are $25 and $15, and make for a great way to see the harbor and the Statue of Liberty up close. Amy Whitley is the founding editor of Pit Stops for Kids, a family travel resource covering kid-friendly resorts, attractions, outdoor adventures, and all the pit stops you’ll need along the way. She also writes for a number of print and online travel publications, and is a family travel expert at Best Family Travel Advice. She lives in Oregon with her husband and three sons, where they enjoy backyard adventures when they’re not traveling.